Welcome to our online catalog of high performance maintenance chemicals and industrial specialty chemicals. 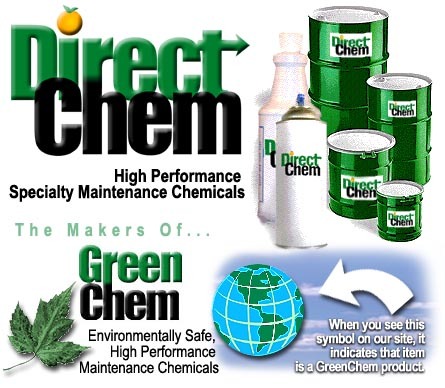 Drawing on our long standing expertise in blending top quality specialty and industrial maintenance products, we have developed DirectChemTM. The product line represents a wide range of maintenance products available at a discount pricing format as well as providing an informative presentation through our online catalog. Within our catalog we have developed a comprehensive line of USER FRIENDLY, ENVIRONMENTALLY SAFE products that PERFORM AT HIGH LEVELS. These products make up the GreenChemTM product line. All GreenChemTM products are indicated with the GreenChemTM symbol as noted above. The saying used to go "BUYER BEWARE." Our saying is "BUYER BE AWARE" . Let us provide you with economy, safety, and high performance products through our efficient catalog supply chain. Complete MSDS accompanies all orders. If MSDS is needed for prior approval, please e-mail us your product MSDS request complete with company information (name, address, phone # and contact person).